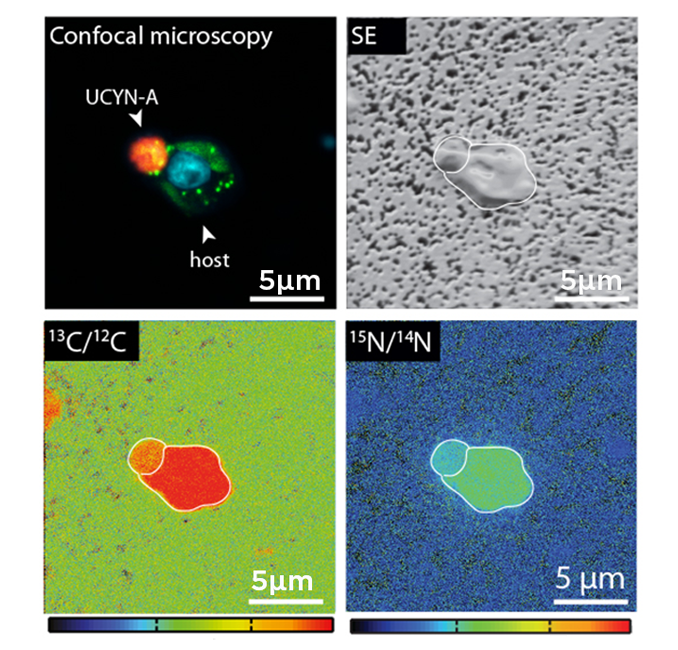 This panel shows confocal microscopy and NanoSIMS 50L images of a two-cell association between a N2- fixing cyanobacterium (UCYN-A, in red) and a unicellular alga (host, in green) from the Tropical North Atlantic. These symbiotic associations are based on mutual transfer of nutrients: UCYN-A transfers fixed nitrogen to the host which, in turn, transfers photosynthetically fixed carbon on the cyanobacteria. Their isotopic enrichment reflects their photosynthetic (13C/12C panel) and N2 - fixing (15N/14N panel) activities and transfer, after 24 hour incubation with stable isotopes. (SE, secondary electron image). The small unicellular diazotrophic symbiont, UCYN-A, is a key player in the marine nitrogen cycle. Clara Martinez-Pérez, Wiebke Mohr, Carolin Löscher, Julien Dekaezemacker, Sten Littmann, Pelin Yilmaz, Nadine Lehnen, Bernhard M. Fuchs, Gaute Lavik, Ruth A. Schmitz, Julie LaRoche and Marcel M. M. Kuypers. Nature Microbiology, 12 Sept. 2016. Image submitted by Sten Littmann and Clara Martinez-Perez, Max Planck Institute for Marine Microbiology, Bremen, Germany.